Enterprise Products Partners L.P. (EPD), a master limited partnership, provides midstream energy services to producers and consumers of natural gas, natural gas liquids (NGLs), crude oil, petrochemicals, and refined products. This master limited partnership raised its quarterly distribution to 40.50 cents/unit. This represents a 5.20% increase over the distribution paid at the same time last year. 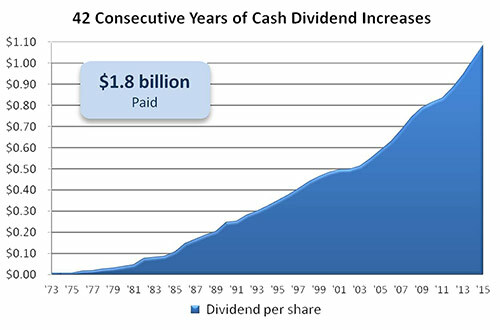 Enterprise Products Partners is a dividend achiever, which has managed to increase distributions for 18 years in a row. Over the past decade, Enterprise Products Partners has managed to boost distributions at a rate of 6.20%/year. This MLP is one of the most conservative ones out there. The distributions have a built in margin of safety, because the partnership saves a portion of cash flow to reinvest in projects. The partnership also offers a 5% DRIP discount to unitholders who elect to reinvest distributions through its DRIP plan. One reason why investors do not like to buy MLPs is due to the fact that reporting is more complicated with pass through entities than with regular 1099 forms. In addition, not many brokers allow you to purchase MLPs in your retirement accounts. Accenture plc (ACN) provides management consulting, technology, and outsourcing services worldwide. The company increased its semi-annual cash dividend 10%, to $1.21 per share. This marked the eleventh annual dividend increase for this dividend achiever. Over the past decade, Accenture has managed to boost dividends at a rate of 20.80%/year. The company has managed to grow earnings per share from $1.59 in 2006 to $5.92 in 2016. The stock is close to being fully valued at 19.60 times earnings and yields 2.10%. While not terribly overvalued, I would prefer a lower entry valuation if I were to initiate a position or add to it. RPM International Inc. (RPM) manufactures, markets, and sells specialty chemical products for industrial, specialty, and consumer markets worldwide. This dividend champion raised its quarterly dividend by 9.10% to 30 cents/share. This marked the 43rd consecutive annual dividend increase for RPM International. Over the past decade, this dividend champion has managed to raise dividends for its loyal shareholders at a rate of 5.60%/year on average. The company understand how this growing dividend is a key component of total returns. Currently, the stock is attractively valued at 17.90 times forward earnings and yields 2.40%. While earnings growth has been volatile, this looks like a shareholder friendly company to research for you soon. Please stay tuned for my updated analysis. Northwest Natural Gas Company (NWN) stores and distributes natural gas in the United States. The company operates through two segments, Local Gas Distribution and Gas Storage. The company raised its quarterly dividend by 0.50% to 47 cents/share. This marked the 61st consecutive annual dividend increase for this dividend king. Over the past decade, this dividend king has managed to increase dividend at a rate of 3.50%/year. Unfortunately, the rate of dividend growth has been slowing down markedly over the past few years. The stock is overvalued at 23.80 times earnings, and yields 3.30%. Despite the long track record of annual dividend increases, I do not believe that this company is a good selection at current valuations. Given the fact that the company has been unable to grow earnings per share over the past decade, and the high dividend payout ratio of 80%, I would expect that the dividend streak will be over within a few years. As we have repeated multiple times on this site, a long track record of annual dividend increases is just one factor to consider. However, there are other things to keep in mind when researching dividend growth stocks.